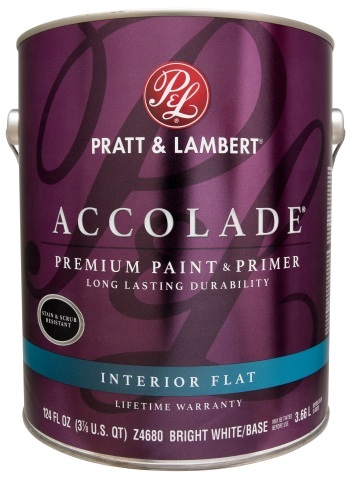 Pratt & Lambert Paints (Cleveland) announced the launch of Accolade Premium Paint & Primer, a 100 percent acrylic, waterborne coating designed for use on interior walls, ceilings, trim, drywall, wood, masonry, metal and previously painted surfaces. The premium product is a reformulation of an earlier version of Accolade, first introduced in 2013, and features high durability, hide, adhesion and a smooth finish, according to the manufacturer. The finish creates a washable, scrubbable and stain-resistant surface, the company adds. Accolade Premium Paint & Primer is available in quarts, gallons and 5-gallon buckets. Accolade Premium is available in more than 1,600 colors—including 100 “exquisitely crafted one-coat hide guaranteed colors”—and comes in a variety of sheens including flat, velvet, satin and semi-gloss, according to Pratt & Lambert Paints. The product retails for $48.99 per gallon and can be purchased at select independent paint dealers nationwide.